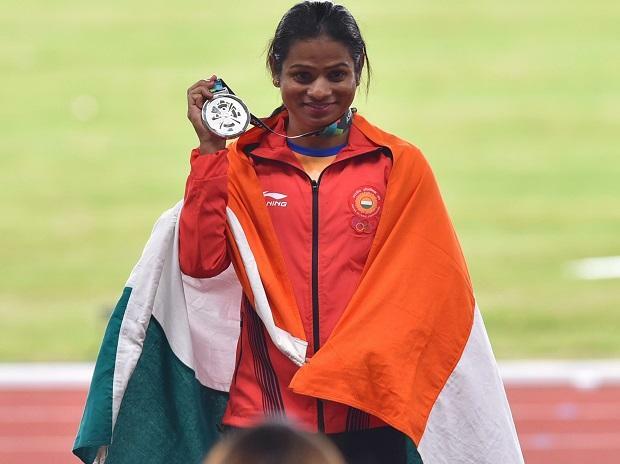 The revision of a controversial 'gender' rule has left Dutee Chand free to compete anywhere but the double Asian Games silver medallist says she is still traumatised by the memories of her gruelling court battle to gain legitimacy. The 22-year-old Dutee clinched a silver each in the women's 100m and 200m in her first Asian Games here as she was not allowed to participate in the 2014 edition while serving a ban under the hyperandrogenism policy of the IAAF (international athletics federation). She filed an appeal against this policy before the Court of Arbitration for Sports and won it. In a recent revision of the IAAF's hyperandrogenism policy (which bars women athletes having male hormones above permissible limit from competing), Dutee has been left out of its purview. The rule now applies to events from 400m to the mile, including 400m, hurdles races, 800m, 1500m, one-mile races and combined events over the same distances. "I have faced a lot since 2014. No one has gone through such a bad phase. I am glad that I could win two medals for the country. As of now there is no issue but there is no guarantee (of any ban)," the diminutive but gritty Dutee told reporters. "Yes, there is always this fear that it (the ban) might come back. But more the fear, the harder I train," said Dutee who was suspended from competing in 2014-2015. On Wednesday, she crossed the finishing line of the 200m final in 23.20 seconds, behind Bahrain's Edidiong Odiong who won gold in 22.96. The bronze went to China's Wei Yongli (23.27). "It feels great to win two silver and that too with my personal best time in the semifinals. I was a little tight today because I had given my all in the semifinal. I could not give my best (in the final race) but I have trained hard," Dutee said. She joined her illustrious compatriots such as P T Usha in the list of athletes who have won more than one medal at the Asian Games. The legendary Usha had swept four gold medals at the 1986 Seoul Games, winning 200m, 400m, 400m hurdles and 4x400m relay. Jyotirmoyee Sikdar (800m and 1500m) had also won two medals at the at 1998 Bangkok Games. Sunita Rani (1500m, 5000m) also returned with two medals from the 2002 Busan Games. Some Asian countries have 'imported' African athletes to improve their profile in athletics. Asked to comment on this issue, Dutee said she does not think about such matters. "Anyone can come and compete, we can't stop anyone. Irrespective of the field, I just try to give my best and fight to my potential. I pushed really hard towards the end but the other girls had long strides, so she (gold winner) edged me out." The Odisha government had announced a cash award of Rs 1.5 crore for Dutee, acknowledging her silver medal-winning performance in the 100m dash. Dutee said she will use the money to get better. "There will definitely be a celebration. The occasion demands celebration. Also, the Odisha government has announced big prize money for me. I already have a house, so I will use this money for my training," she said. She also acknowledged the contribution of various people who have helped her in tough times. "I was allowed to train at Pullela Gopichand Academy (in Hyderabad) during that time. I want to thank my legal team also which helped me winning the case," she signed off.